Tina Garg is the Founder and CEO of Pink Lemonade, a creative agency specializing in communication, content, and design. Starting the company in October 2009, Garg has worked relentlessly to ensure its astounding growth rate. She has channelled her passion for writing, design, corporate communication strategy, branding, content development, and advertising into her work to remain at the top of her game. 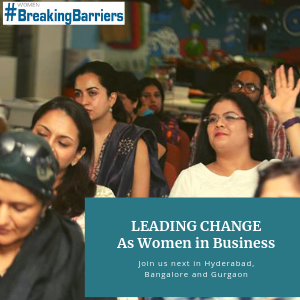 Garg was chosen from among 10,000 women in the world to be coached by Goldman Sachs and ISB, as part of the ‘10,000 Women’ program which provides women entrepreneurs business and management education, mentoring and networking, and access to capital. Apart from this, Garg is a mentee at the Cherie Blair Foundation, which also supports women entrepreneurs across the globe. Before starting out on her own, Garg had been an Internal Communications Specialist at Ernst & Young. She also worked as a content writer at CBEYOND and a Communications Coordinator at Murray Culshaw Consulting. Garg is a graduate from the University of Pune and holds a Master’s degree from the prestigious Indian School of Business, Hyderabad. 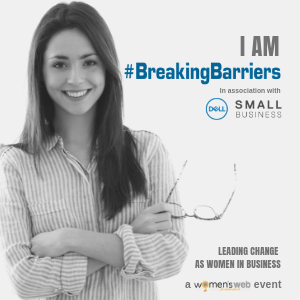 Tina Garg is a guest speaker at the Breaking Barriers To Business Growth Step Above event (Bangalore venue) and will be sharing her experience with building a business and crossing the hurdles to growth.